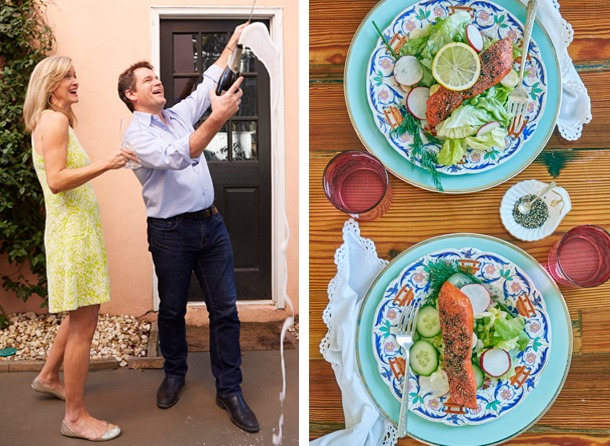 A simple springtime meal for the couple and their family includes a grilled salmon salad, which nods to his and Anne’s time in South Africa. “In Cape Town, if we wanted to eat pescatarian, we had to learn to cook for ourselves—so we began grilling local fish.” He perfected the art stateside while working under S.N.O.B. chef Frank Lee, who taught Emerson to grill salmon skin-side up so that the delicate flesh retains moisture. The pink fillets are served atop butter lettuce, dill, cucumber, and radish slices drizzled in homemade lemon-garlic vinaigrette. Find the recipe below, and consider serving it alongside the other dishes Emerson shared in our March-issue In the Kitchen article (hint: they include “shepherd-less” pie, asparagus soup, and chocolate mousse). Rinse the salmon steaks under cold water and pat them dry with a kitchen towel. Sprinkle the salt and pepper over the flesh side of the fish and gently rub it in. Grill the steaks skin-side up for two minutes. Rotate the steaks 180 degrees, and grill them for another two minutes. Flip them over, then grill them skin-side down for two minutes. Remove from grill and cool to room temperature. For the rest of Emerson’s spring supper recipes, click here. To read more from our March issue, click here.